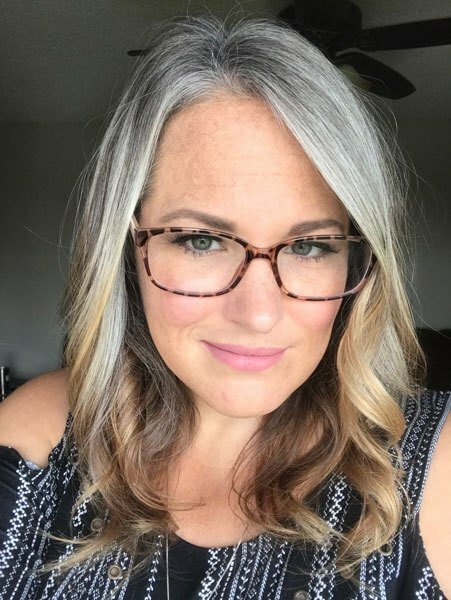 Going Gray and Keeping Your Hair Long? Here's What To Expect! Which begs the question: Why do so many people feel free to give us their opinions about our hair? I’m still trying to figure that out! It’s one of the great mysteries of the universe. On social media, I often get asked why I don’t cut my hair short. I have been told it will hasten my gray hair transition, enhance my self-esteem and free me from worrying about satisfying the sexist desires of the men in my life. However, none of those scenarios apply to me. 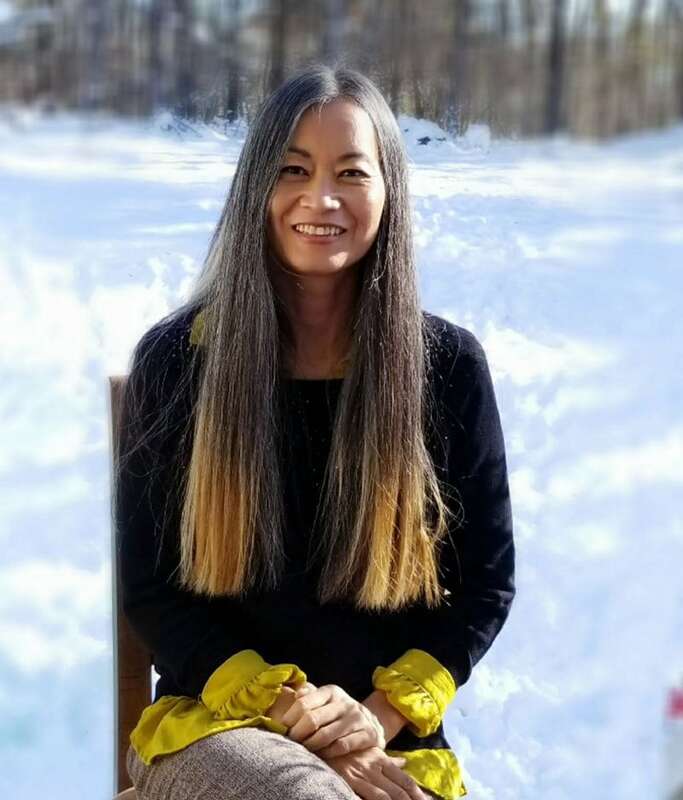 I have a healthy amount of self-esteem, I have a supportive husband who loves me no matter what type of hair I choose to wear, and I don’t want to hasten my gray hair transition because I am loving every slow minute of it! So why DO I wear my hair long? Let me explain. For most of my childhood, I had short hair. Really short hair. We’re talking male-pattern baldness short. Imagine Paul Simon in the 1970s and you’ll get the picture. I’m not sure why, except that my Mom was a busy mother of 3 children. Plus, I seem to remember that the few times that I had long hair, I either got gum stuck in it or experienced horrible tangles that would have required the assistance of the CIA to infiltrate. 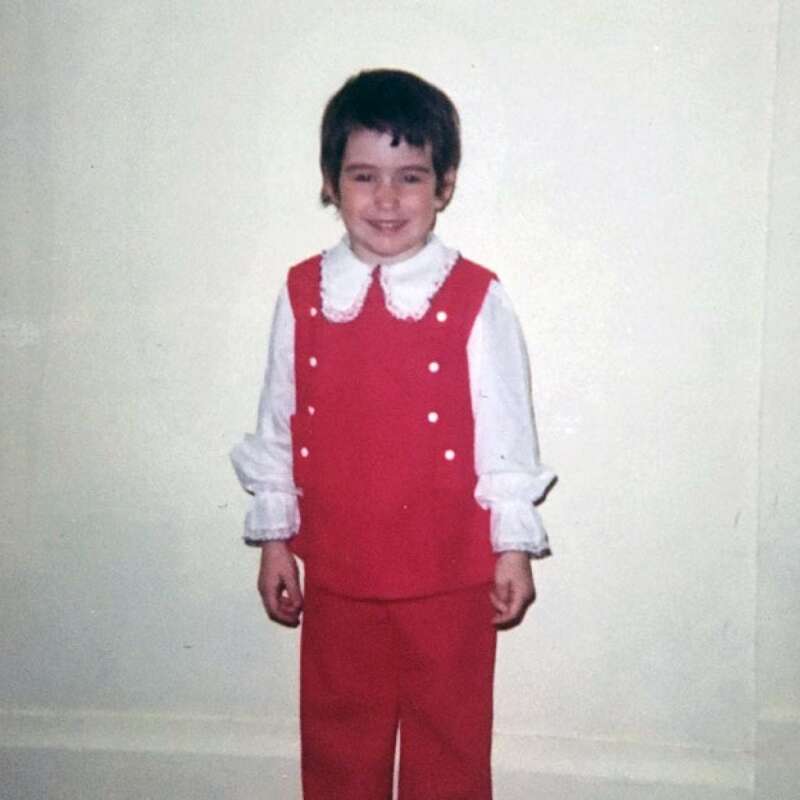 Katie at age 4…or Paul Simon? My best friend, Suzy, had long, golden curls. She had Jan Brady-style blonde hair (clipped back with a barrette, and ringlets coming down on each side). I envied her hair and wished that we could somehow trade hair. I wanted long hair badly enough that I would parade around my house with a bath towel on my head and pretend that it was my long hair. Imagine my excitement when I found a lovely red hippie wig at a garage sale. It was the most beautiful copperish-auburn color, and it was the perfect early 1970s hairdo – long, straight, and parted in the middle. I bought it for 25 cents and don’t remember much about that wig except that I LOVED it. I also remember scaring the crap out of my parents one morning on our way to church. They looked in the rearview mirror, expecting to see their little brunette Paul Simon-ish daughter, but instead saw a REALLY short redheaded hippie girl in the back seat. It’s a miracle they didn’t crash the car! By the time I was a teenager and old enough to make my own hair decisions, New Wave was in and long hair was out. But in the early 1990s, I moved to North Carolina for graduate school. The girls down South tended to be more traditionally feminine, and I started letting my hair grow… and grow. It was BEAUTIFUL! I finally had gorgeous, long hair and I really felt “at home” with it. I also appreciated the color, which was a very dark brown chestnut shade. For the last 26 years, my hair length has ranged from as long as the middle of my back all the way to a chin-length bob. But long hair is really what I prefer. I feel like “myself” in longish hair. That’s “the long and short of it” (LOL). There’s no deep psychological meaning to it. It’s simply a matter of personal preference. And you know those old 1950s era “rules” that suggested women over 40 should cut their hair short? I think those kinds of rules are outdated and need to be discarded, don’t you agree? Why can’t we have autonomy over our own hair, for gosh sakes?! But why go gray cold turkey? 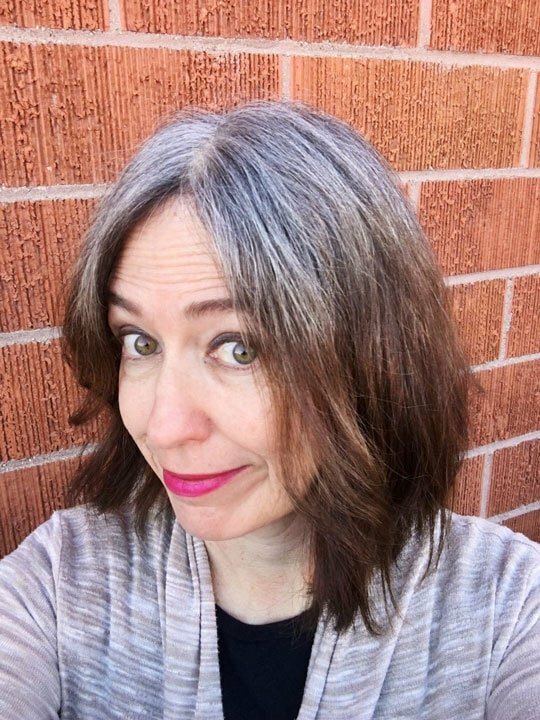 When I made up my mind to go gray back in February 2018, I researched different ways to go about it. As I’ve said before, I was a brunette for 50 years and knowing myself pretty darn well, I knew that I needed time to shed that identity. I knew that if I went from being a long-haired brunette to a short-haired silver sister overnight, it would be traumatic for me. I also knew that I was simply done doing any sorts of coloring or chemical treatments. I’d had a bad experience bleaching a small (thankfully) portion of my hair in college (it turned bright orange and was very damaged). Therefore, I chose to do a cold-turkey grow out, which basically means not doing any more salon treatments on my hair except for an occasional trim. 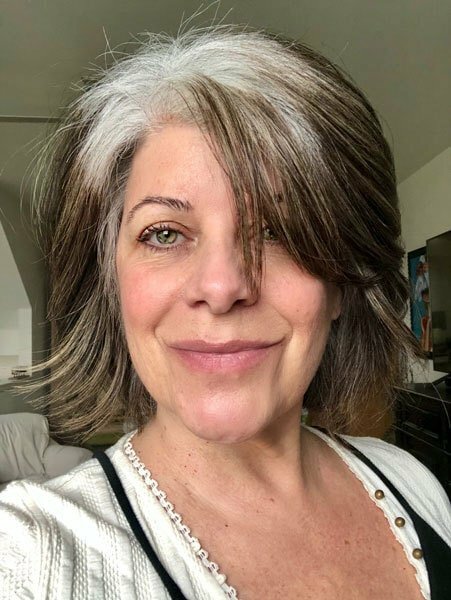 It took me a long time to decide to go gray and stop dyeing but I felt like if a woman had the right to say, “I want to keep dyeing my hair”, then I had the right to say “I don’t want short hair” if I ever did stop. My dark hair was my identity. So I clung to my dark tresses and when I started to go grey I covered it up for years until it just became a hassle. Every two weeks a white halo appeared. I researched it watched YouTube videos etc. 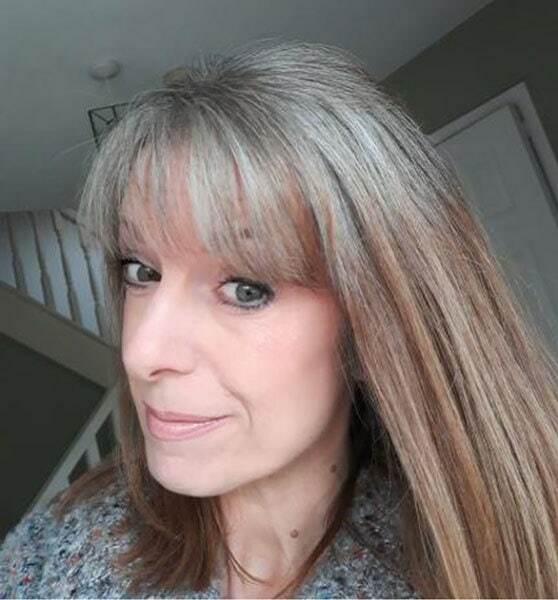 and finally made the decision with one stipulation; that I would not cut it off but I would go through the process and give myself time to get used to the new hue of color around my face. I knew it would be hard and people would share their opinions but I need the daily transformation to learn to love my new self and whatever color my hair decides to become. If you want to keep your hair long during your cold turkey gray hair transition, just keep in mind that you will go through a “calico” or “two-tone” phase. If your hair is dyed a dark shade, like mine was, you will definitely be sporting a skunk stripe (i.e., demarcation line) for a little while. @flawsome_momma is at the early stages of transitioning, so the demarcation line is stronger. Below, you can see how much my dye has faded since I began. The skunk stripe phase really didn’t last that long. Once your roots grow in a couple inches, your gray grow-out will start to look intentional, and that’s when the real FUN begins! 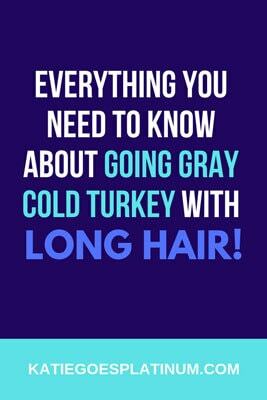 To wrap things up, here are the Pros and Cons of keeping your hair long during your cold turkey gray hair transition. 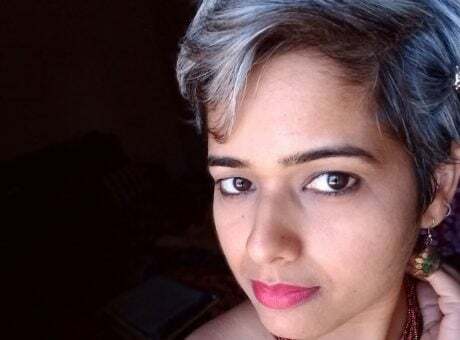 If you are being driven crazy by your long hair and just want to be done with the transition, check out my Silver Hair Transition Stories for women who went the pixie route. They have great tips and rock their shorter hair! How about you? Long gray hair or short gray hair? Let me know why in the comments! I had just colored my hair the day before, I woke up the next morning with a “thought” I am finished with the dye, it’s like an awakening. I never really gave it much thought before , where did this thought or idea come from, who knows. 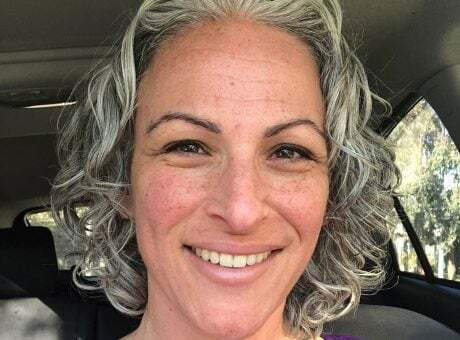 Could it be a “connection” as so many women are ditching the dye? So, it makes me think we ARE connected on this planet! Dec 21, 2018 I started my journey on this rainbow, because I am after that pot of Silver! I was a hairdresser previously so, I knew that I would have to do the “Cold Turkey” to keep my long hair healthy, which includes the colored hair. I made a few announcements with my family, friends, and work, everyone embraced this with excitement, except my daughter…lol. She will get over it! What a great comment, thank you Teena! I’m so glad the videos help you. And I’m so glad you are on this journey with me and all the other silver sisters! I am a “redhead” with medium length hair. I’m done with dyeing ( for almost 40 years!) I want to feel liberated. I don’t want all those chemicals in my hair anymore, especially as a 2-time cancer survivor. And the salon expense and wasted time not for me anymore. I’m ready to make the cold turkey transition now. I’m willing to have multi-colored hair for a while, whatever the color. My only concern is that I want to get back out into the dating circuit, and I am a bit concerned that my transitioning hair may be a turnoff to many men (I’m in my mid-60’s). But, I need to do this for me. Any suggestions as to handling dating while going gray? Hi, Candace! Have you read Going Gray by Anne Kreamer? She did a lot of controlled experiments and found that gray hair on a woman didn’t affect her dating life at all. Yay! In terms of the transition, see my post about How to Make Your Cold Turkey Transition fun. A lot of women use headbands, scarves, root powder, etc. to cover the demarcation line until their dye fades and things start blending better. Good lucK! Oh. My. Gosh. I could relate to your childhood totally. I will never forget the day in elementary school when my mother took me to the salon. I had long hair. I dreamt about having hair like Farrah Fawcett. When we got to the salon I was so excited because that’s what I thought I was going to get- Farah Fawcett hair! Little did I know ….mother had already talked to the hairstylist. She cut my hair off. I mean, off. I think my father’s hair was longer. My little sister ( now age 52) still remembers it. She cried with me. Since then I have had shortish hair but I’ve always dreamed of long hair. Sometimes I literally have long hair dreams! Eight years ago I stopped coloring. My mom died last year and several months later, suddenly I thought…yes, I’m going to grow my hair. This is a healing thing for me and very personal….and I don’t care what anyone thinks anymore. And you are so right-its none of anyone’s business how we wear our hair! This is Kani from FB by the way. Hi, Kani – so glad you could relate! That sounds traumatic. I would have loved to have had Farrah Fawcett hair, but the closest I got was the Dorothy Hamill cut :-). I think your long hair will look beautiful! 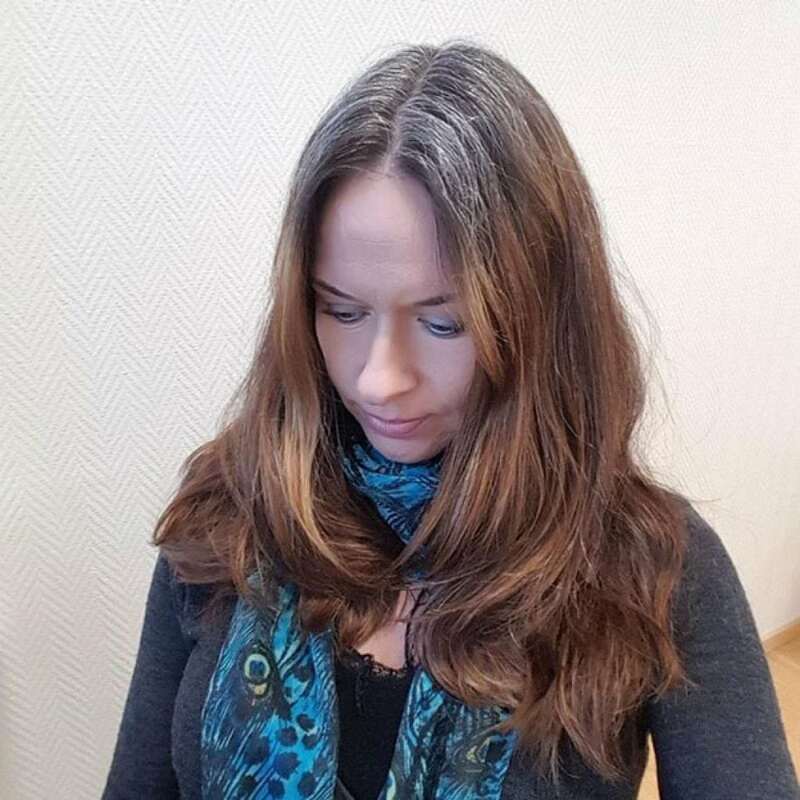 I am long haired brunette and started the transition about 4 mos ago when I could no longer handle the chemical fumes. I have COPD. It was not by choice, but so I could breathe. To me I look like an old hag. Plus I put on 100 pounds after a long illness and just feel awful. My hair is 3 colors. Dark brown from my neck down, reddish brown from years of the skunk stripe not taking the dye properly, and yellowish gray from the roots to my eyebrows. I’m so sorry to hear about your health issues! 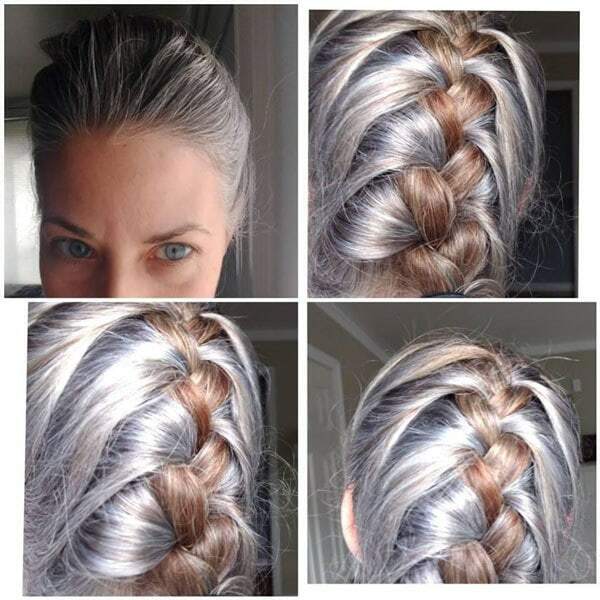 You might want to try the QuickSilverHair Clay by Joli Campbell. It really brightens the hair and helps with yellowing. In terms of fading the browns – you definitely will have to use the dandruff shampoo or clarifying shampoo treatment more than once. I use Neutrogena Anti-residue shampoo once a week and it has REALLY faded my dye. 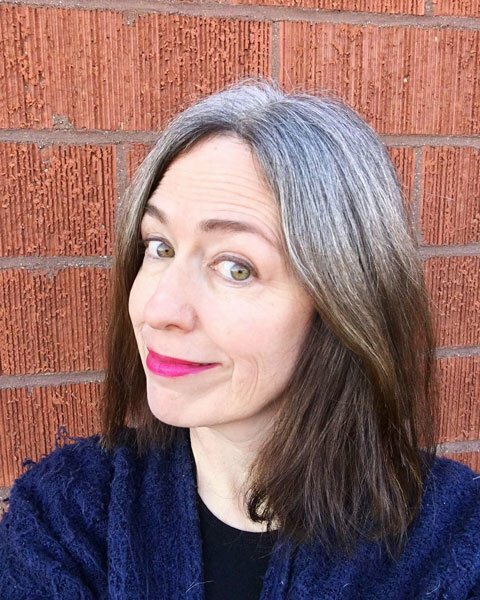 Other than that, it’s hard to say what could make your hair more silver – highlights/lowlights and gray blending are all out as they would have chemical fumes as well. I say try the hair clay and start using a clarifying shampoo once a week. Hope that helps! 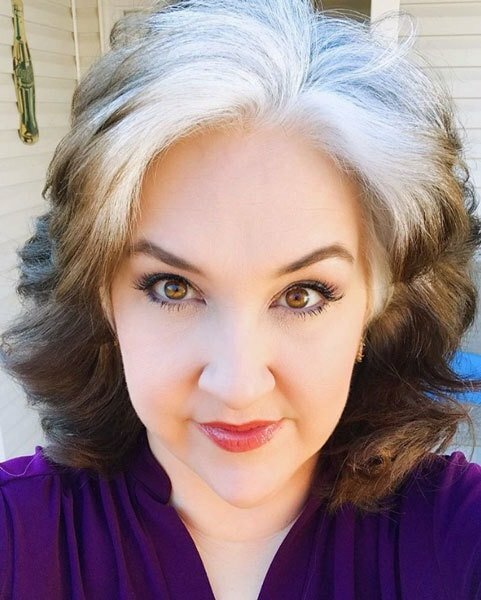 I am so pleased to be going grey! So fed up with the chemicals for me and the world’s health. I now have the courage to stay long while I transition just because I can and because these powerful women chose to as well. I just think of the vastly creative hairstyles out there now and I wonder, “what the heck was I worried about?.” I am going to use creative additions, styles etc. to really work with my hair. If I go short, I go short. But for now, I love my long hair and now I know that I don’t have to give it up for anyone! It’s mine. Besides, I am not my hair. You’re welcome! My sentiments, exactly. Why was I so worried?! I am in the middle of transitioning and enjoying the beautiful white around my face. The rest is salt and pepper. I can’t wait! I spent $$$ at Ulta for blending that made it worse. Purple/blue shampoo are my best friends. That sounds like a beautiful transition! Very striking. Unfortunately, the only real way to see what your gray will look like is to let it grow for a few months. But even then, it’s hard to predict what it will look like when you are fully done. 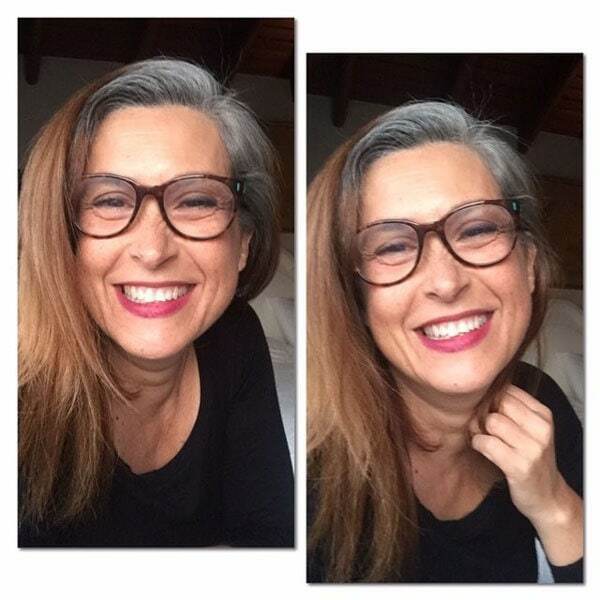 Take a look at Grombre on Instagram or Facebook – or join our Silver Revolution group to see all the lovely ladies with gray hair and get inspired! 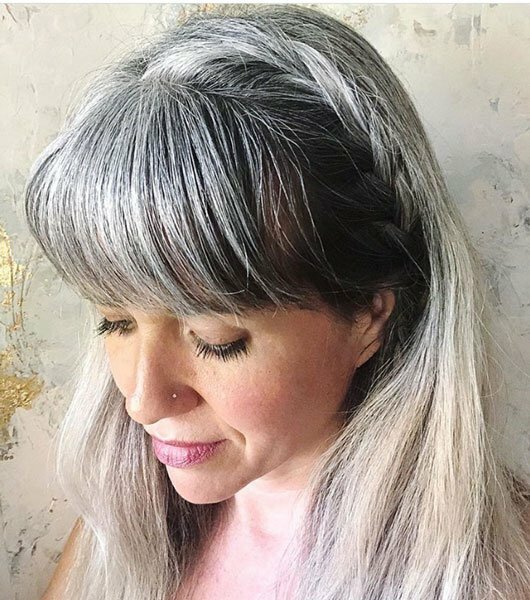 If you don’t want to let your gray grow out, you can also talk to a stylist at a salon to find out if they do grey blending or other methods to help blend your natural hair as your dye grows out. Check out my salon directory for a gray-friendly salon, or follow the link at the top of that article for how to pick a gray-friendly stylist if your city is not listed. Good luck! I really relate to this post, still, even though my gray has completely grown out. I did cut my hair shorter near the end, but I wouldn’t call what I had a “big chop.” Since then I’ve let it grow out, back to shoulder length, and it feels more “me.” I have wavy hair and feel I need length to weigh it down a little, so it doesn’t spread out. My stylist (who I love) keeps encouraging me to cut it shorter, saying I need an “edgier” cut to avoid aging myself. I have trouble resisting her because I value her opinion, and she encouraged me in my decision to forego the dye. But I air-dry my hair and feel that more of a “style” isn’t me. I’m overdue for a trim and am going there tomorrow, but I’m unsure what to do. 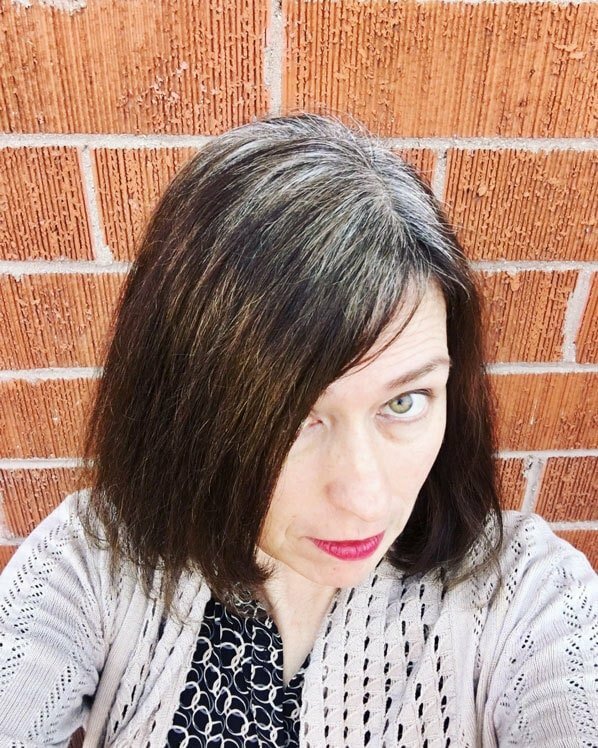 Transitioning to silver/white/grey hair, to me, it’s a new chapter in life. Letting go of the old me & embracing “the best is yet to come”. *learning to love my natural curly hair as well. Vicki, you definitely sound on fire!! 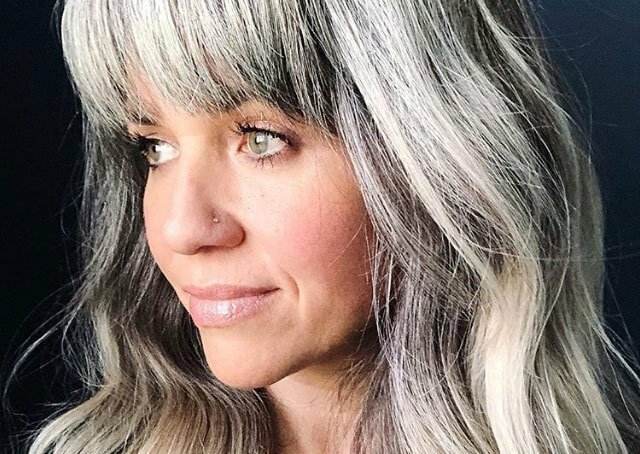 Who knew going gray could be so fun?! Thanks for sharing, Katie. I’m a long hair person, and have cringed at the thought of cutting my hair short to transition. I’m going for a trim tomorrow and what you have said really helps me rethink cutting it short. Thank you! You’re welcome, Lynda! So glad it helped you! The best thing I could have done, is go gray! I am growing it longer because it is actually extremely healthy! I do love the looks I get from women! I think they envy me! Lol. Also, what could be better than not planning your life around getting your roots touched up! Agreed! I hated planning everything around root touch ups! Nice to have “met” you in the Silver support group on FB and I’m enjoying your blog so much! At 11 months in I ALMOST CAVED!! I was hearing it from coworkers and some friends telling me GREY HAIR ISNT YOU!!! I consulted 2 stylists whom I trust about how to go about just adding super ash light highlights! But all I could feel was scared of more potential “Blorange ”!! I went back into my silver transition groups and found the support I needed to persist!! That’s when I found ❤️YOU❤️ . The coworkers and friends were wrong. Silver hair IS me!!! I decided then that long hair IS ME as well and even though during this transition I’ve cut a total of about 12 inches of length off my hair, I’m comfortable with going through it with long hair! Thanks for your blog and support!! I love this Katie, and I won’t cut my hair!! I’m glad to hear it, Jonie! You have gorgeous wavy hair!